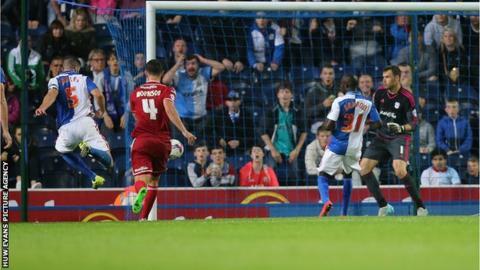 Grant Hanley claimed a late equaliser for Blackburn Rovers to deny Cardiff. Cardiff cleared their lines but allowed Rovers to play the ball back into the area and Hanley side-footed home. Rovers might even have snatched the win but Shane Duffy saw two efforts cleared off the line in a frantic finale. Joe Mason's early goal had seemed set to give Cardiff victory, as he capitalised on a poor clearance by goalkeeper David Raya that was intercepted by Lee Peltier. Rovers had good chances to level before half-time, but David Marshall - restored to the Cardiff goal after suspension - made smart saves from Bangaly-Fode Koita and former Bluebird Craig Conway. Koita did have the ball in the net, glancing home Tommy Spurr's free-kick, but he was ruled offside. Cardiff were not content to just sit on their lead at Ewood Park and Joe Ralls's skidding low drive had to be shovelled away by Raya, with Hanley completing the clearance. Rovers continued brightly after the break and Nathan Delfouneso's deflected strike clipped the crossbar after he was played in by Duffy. Hanley somehow missed with a free header at the back post and then saw his blocked shot fall kindly into Marshall's hands. But the defender made amends with his side's equaliser to rescue a point for Rovers - although the result leaves both sides still seeking their first league win of the new Championship season. Blackburn Rovers manager Gary Bowyer: "The captain (Hanley) was magnificent tonight. He could have had a hat-trick. He led by example. We forget that he's only 23. "I think the response - we peppered their goal just before half-time, and even when we've scored, (David) Marshall's made a save and we've had one cleared off the line. "So the lads just kept going and had a great spirit and belief about them, which for a team put together in the last week is not bad at all." Cardiff City manager Russell Slade told BBC Radio Wales: "It is three points lost when you get so close and I was gutted for the players tonight. "They did have a weapon with that long throw and they've got some height, a threat from a set play, so at some stage the ball might just drop for them and unfortunately it did in the last few minutes. "I thought we'd just about seen them off; they came at us strong in the second period... it looked like we'd weathered that and might even get one on the counter-attack to wrap the game up." Match ends, Blackburn Rovers 1, Cardiff City 1. Second Half ends, Blackburn Rovers 1, Cardiff City 1. Attempt saved. Grant Hanley (Blackburn Rovers) header from the centre of the box is saved in the centre of the goal. Assisted by Craig Conway with a cross. Corner, Blackburn Rovers. Conceded by Lee Peltier. Attempt missed. Craig Noone (Cardiff City) left footed shot from outside the box is close, but misses the top right corner from a direct free kick. Foul by Nathan Delfouneso (Blackburn Rovers). Kenwyne Jones (Cardiff City) wins a free kick in the defensive half. Goal! Blackburn Rovers 1, Cardiff City 1. Grant Hanley (Blackburn Rovers) left footed shot from the centre of the box to the bottom right corner. Assisted by Craig Conway with a cross following a corner. Corner, Blackburn Rovers. Conceded by Scott Malone. Substitution, Cardiff City. Craig Noone replaces Joe Mason. Attempt missed. Ben Marshall (Blackburn Rovers) right footed shot from long range on the left is high and wide to the right. Offside, Cardiff City. Anthony Pilkington tries a through ball, but Joe Mason is caught offside. Offside, Blackburn Rovers. Hope Akpan tries a through ball, but Nathan Delfouneso is caught offside. Joe Ralls (Cardiff City) wins a free kick in the attacking half. Nathan Delfouneso (Blackburn Rovers) wins a free kick in the defensive half. Corner, Cardiff City. Conceded by Jason Lowe. Substitution, Cardiff City. Aron Gunnarsson replaces Kagisho Dikgacoi. Attempt blocked. Kenwyne Jones (Cardiff City) left footed shot from outside the box is blocked. Assisted by Kagisho Dikgacoi. Offside, Blackburn Rovers. Craig Conway tries a through ball, but Modou Barrow is caught offside. Attempt blocked. Grant Hanley (Blackburn Rovers) left footed shot from the centre of the box is blocked. Assisted by Ben Marshall with a headed pass. Substitution, Cardiff City. Kenwyne Jones replaces Alex Revell. Substitution, Blackburn Rovers. Danny Guthrie replaces Adam Henley. Attempt missed. Grant Hanley (Blackburn Rovers) header from the centre of the box is high and wide to the right. Assisted by Thomas Spurr with a cross following a set piece situation.